In 2013, we decided to take our film making skills to the next level and we started working on "The Hitchhiker" short film. The script took about 2 months to complete, casting also took about 2 months, filming was done in 5 days and post production took about 5 months. 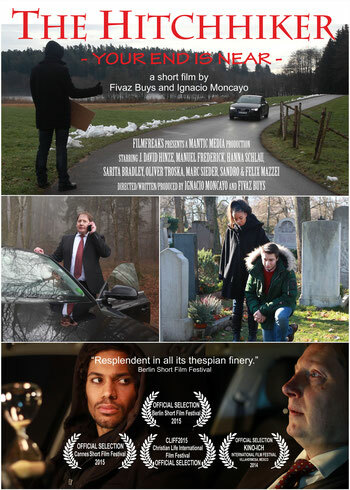 We were very pleased that our film was shown at 7 film festivals in 6 different countries. After more than 25 years in pursuit of his deceased brother's dream, Mark Seymore has lost the joy of life. One day, on his way to a business meeting, Mark picked up a hitchhiker and this turned out to be the biggest mistake of his life, or was it? The Hitchhiker is a story about a person who seems to have it all, but appearances can be deceiving and deep inside, Mark Seymore knows that his life needs to take another direction, but what will it take for him to change his ways?